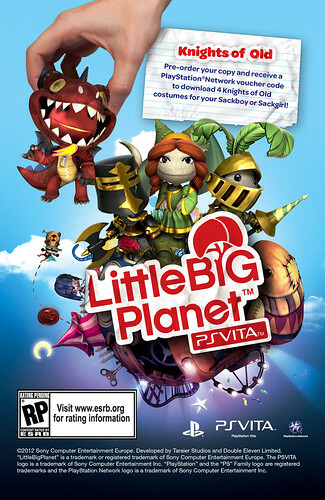 Starting today, LittleBigPlanet fans will be able to pre-order the upcoming PS Vita installment of the game, and those who do will get themselves a snazzy set of bonus costumes as a big thank you! The bonus costumes include the iconic Big Daddy and Little Sister from BioShock, as well as new Knights of Old costumes to dress up your Sackboy or Sackgirl as a knight, damsel in distress, black knight, or a fearsome dragon. The details of this offer will vary depending on which country you live in or where you pre-order from, but here are some pictures of the costumes to whet your appetite. Pretty cool, right? What’s especially neat is that the particular colors of these pre-order Knights of Old costumes will remain exclusive forever! In other news, as you might have heard E3 took place last week in sunny Los Angeles. We had a great time showing off LittleBigPlanet PS Vita to everyone who came by and got an amazing response. Here’s what a few media outlets had to say. At the top of this page, you can check out the new trailer for the game we showed off at E3. You can also watch our live demo with the PlayStation.Blog team here. Finally, here’s a video of a demo we gave the Los Angeles Times at the convention. I’ll be happy to pre-order… when is it coming out? Don’t say early 2013. Ive already pre-ordered with GAME i wonder if ill get the bonuses too. WHOOP, LBP NEVER LOSES ITS TOUCH. Get it, Touch. I preordered at Gamestop, so which do I get? Give digital pre-orders or 1st week buyers the bonus content, Simon! The community loves the LBP franchise & your team at Tarsier has been living up to our expectations. As soon as we have anything to share regarding the digital version we will make sure to let everyone know! What about those who wish to buy it off PSN? How do I preorder off PSN and still get this offer? 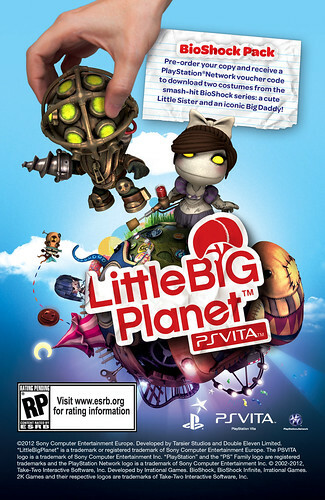 So where is the pre-order on the PSN Store for North America for Little Big Planet Vita. That is the kind of pre-order I can support (especially one that only offers digital goods as the reward for purchase). Will there be a notice longer ahead of time if the digital purchase will include all the DLC offered as preorders? With Gravity Rush if you purchased it digitally you would get ALL the DLC packs for free when they were released, had I known that I would have canceled my physical copy. And before you ask, these costumes will of course be compatible with LittleBigPlanet 2! It better releases this year. One of the games I bought a Vita for! What about those downloading it? I am downloading day 1 and would REALLY like to not have to buy 2 copies to get the DLC!! Awesome news though, loving the beta! It’s already, to me, a superior game to LBP2. Seriously, the jump from LBP2 to LBPV is as big as the jumpt from LBP1 to 2 was! Will we be able to pre-order off psn? So, is there any option for the PSN download? Also, what about a release date… or range at least? You know it would be brilliant to tie this in with a PS+ discount right ;). Was pleasantly surprised with the beta – good work, guys. Will there be an option to pre-order from PlayStation Store? and if so will there be the same pre-order bonuses? I’ll be purchasing this game through PSN. How do I get these pre-order bonuses? Throwing my voice out there for a PSN pre-order with a bonus too. I got a 32 GB card for my Vita so I could go the download only route with my Vita and it’d be awesome to start seeing pre-order bonuses for people like me, or promotions like there was with Gravity Rush where if you buy the game during a certain release window you get a bonus. Thanks! The LBP beta is really enjoyable — can’t wait to play the full game! Like most other people in the comments so far, I’m planning on buying this digitally on the PSN. Will we get the pre-order bonuses as well? Definitely agree with those who want to preorder digitally. I would love to be able to hop on the game whenever I want! This. Is. Awe-Haw-Some! I love that Big Daddy costume! Now I have to figure out where I can Pre-Order this from. If you make digital preorder an option for this, you can have your $ right now. Just take it. This year better turn into next month or so real quick. Give us a solid release date before hauling out the pre-order bonuses. I should feel ashamed to say this, but preordering for bonuses, then returning game. I’m a slave for nabbing exclusives, so looks like I’ll be shufflin’ again. Thankfully, I think I make enough for-keeps orders from Amazon that they wouldn’t mind an awful lot. So far been loving the Beta of this on the Vita. Would like to know as others above, if this offer will be for download as well. Or any offer for those of us in Canada ? Is there a reason why pre-ordering games through PSN isn’t a feature? I think it would be neat if you could pre-order and it would automatically download and charge your card/account when it was posted. Then you could offer the same pre-order bonuses. It seems like it keeps confusing customers to have to guess where to purchase a game rather than just being excited about the game. I was already probably going to pre-order it, but now I definitely am, for the Knights of Old pack. Also I think I speak for everyone when I say: DON’T EVER GET MY HOPES UP FOR A RELEASE DATE, THEN DASH MY HOPES!!! Sweet the vita is getting better and better. im such a spoiled dude that because i didnt receive the beta for the vita i will NOT be buying this game. and i dont mean somefoofee Demo a week or 2 before its released… today you guys twist the work Demo with beta and ppl go for it… im talking closed beta..
How’s that all work, does anyone know yet? I hope bad things happen to you, which in turn teach you valuable life lessons. Really I do. You are a true example of an entitled POS. Just to be clear, you pre-order once and you get everything right? The packs aren’t seperated among different retailers, right? As said in the announcement, the exact details can vary from retailer to retailer. Got to play LBP Vita at E3 this year and was floored. So, so good! It really did feel like the console version in the palm of my hand. I cannot WAIT for this to finally release. My Vita is ready! I’ve had it pre-ordered since December of 2011! Release it soon!! @slaysme, lmaooo… if i knew you i’d deal with you but since its a blog im not a internet gangster. I know a buddy of mine will be stocked to hear the BioShock pre0order news. I am a little confused about the pre-order though? If I pre-order the game (which I already did) do I get all 3 costumes, or does each country/region get a specific pre-order costume??? in the bottom of the Bioshock poster I see Bioshock Infinite, will Elizabeth, Booker and songbird be available too?, OK maybe it’s a surprise, but will these costumes come to LBP 2? and the other one, I know you’re tired of people asking it, but is the DLC from LBP 1, 2 and vita compatible with karting? When you say that the costumes will be compatible with LBP2 how does that work? You download it on the vita and then you transfer it over to LBP2? Does that also mean all LBP Vita DLC will be Compatible? I have already preordered LBP Vita from GAME UK. But, I did a ‘pickup in store’ type of preorder, so do I still get these costumes? Ok great. but what about the freaking release date. seriously you guys talk about everything else but when it comes to a release date all we get is stay tuned. the game was announced last year and we get is stay tuned. Sorry about that, but we want to make absolutely certain that once we finally do announce a release date, we can stick to our word. @25, you’re not the only one who is using that “workaround”. I canceled my “pre-order” in favor of the digital Gravity Rush. Re: the late announcement of DLC for digital purchases– isn’t the answer obvious? Announcing it ahead of time will discourage retail purchases & Sony would be stupid to make its larger retail partners mad every time a game is released. I agree that it would be nice to know if Digital buyers get these bonuses as well. I would like to buy this digitally, and would hate to miss out on great DLC. I mean its good to know if i should pre-order a physical copy now and getting the DLC for sure, since i doubt theyll have any left near/around the time the game is released, than waiting till its released digitally and not having it.